The waxing crescent Moon passes in front of the star cluster M67 on the evening of 26 May. AN graphic by Greg Smye-Rumsby. The Moon's perpetual eastwards journey against the starry background will cause it to pass in front of or occult many stars with a wide range of magnitudes. Occultations of really bright stars are not as common as one would think and those involving the planets, or at least those visible from the UK, are pretty rare. 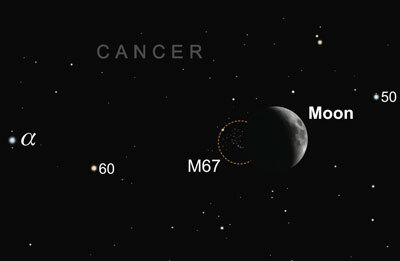 But to make up for this occasionally a well-known and bright deep sky object is occulted and on Saturday evening (26th) from 10pm it's the turn of the open cluster M67 in Cancer. As with many 'on the face of it decent events', the observing circumstances from the UK are not ideal, with a waxing 5.5 day-old Moon relatively low over the western horizon and sinking further into the mire as twilight darkens. It starts to get dark around 10pm BST and the Moon has already bitten a large chunk out of M67. It will be difficult for visual observers to see many of the fainter cluster stars disappear behind the dark lunar limb; if you have a 150-mm 'scope then around 50 stars in M67 can be seen with the number swelling to in excess of 100 in a 300-mm. Of course at this low altitude atmospheric extinction, together with the twilight and lunar glare will wipe out the fainter stars, but it still will be well worth trying to observe the disappearance of as many stars as possible. The clusters brightest star is magnitude +7.8 HIP 43519 and this is a good target to aim for. The disappearance of this star occurs at the dark limb at 10.48pm BST from London and at this time the Moon will be 15 degrees up. From Edinburgh, the star disappears about five minutes earlier. Astrophotographers should be able to capture some of the cluster stars alongside the Moon if a site with a clear, uninterrupted western horizon can be found. M67 pictured by Greg Parker. M67 (NGC 2682) is the second Messier open cluster in Cancer, with the limelight usually hogged by the brilliant Beehive Cluster or M44. But M67 is well worthy of attention in its own right as it shines at a healthy magnitude +6.9 and covers 25 arcminutes of sky; at its distance of 3,000 light years this equates to an actual physical diameter of 21 light years. 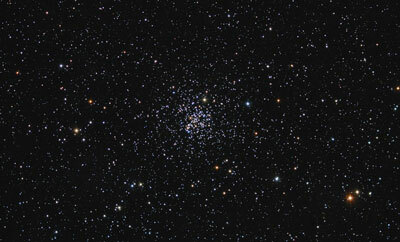 It is an ancient open cluster, one of the oldest known and is thought to be in the region of 3.7 million years old. Furthermore, it is thought to be less than half way through it's lifespan. Due to its great age M67 contains many well-evolved stars, with around 20 red giants and over 150 white dwarfs. This great diversity of stars has lead to M67 being one of the most important photometric clusters, with many of its stars being so-called 'standard stars' for the UBVRI photometric filter system.